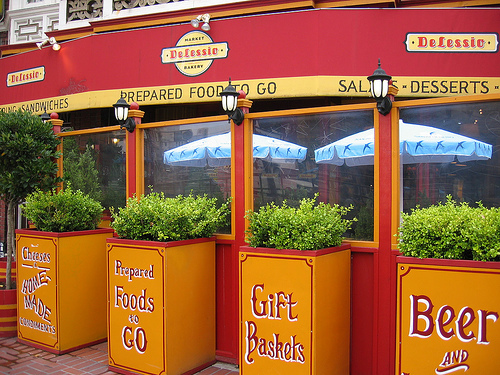 I thought I'd christen a new series on this beautiful but windy Monday by talking about DeLessio's on Market St. I had lunch here today. Now, the sandwich (a Cuban) was yummy. I give them that. (It was not, however, as good as the one I had at Arlequin a few weeks ago). However, my sandwich, Diet Coke, and bag of chips was about $13.00. And, to top it off, the place has a sign that asks its patrons to clean their tables off when their finished to help keep the place looking nice. For the price I'm paying for this lunch, the owners could hire a Guatemalan woman to feed my sandwich to me and clean up when I'm finished. Throw in a nice back rub, and I'll give the place 4 stars on Yelp. Darling Todd, 13.00 !!! I might just faint! That's exactly the yearly salary I pay my maid, Propecia, honey I think they saw you comming!